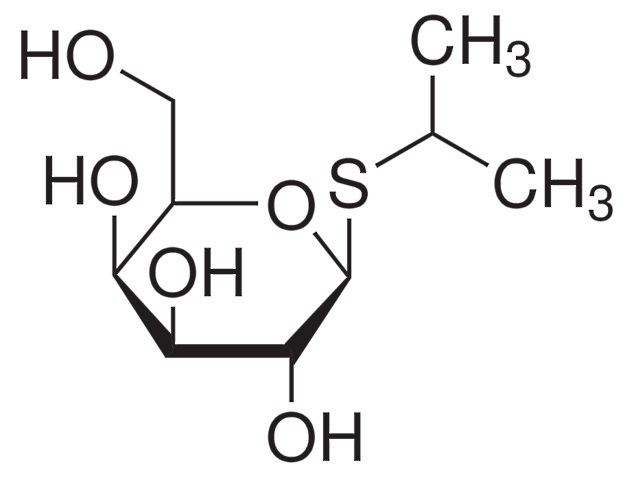 IPTG (Isopropyl-β-D-thiogalactopyranoside) is an analog of galactose that is non-metabolizable and inactivates the lac repressor to induce synthesis of β-galactosidase in E. coli. The expression of cloned genes under the control of the lac operon is induced by IPTG. It is also a substrate for thigalactoside transacetylase and has been reported to induce penicillinase in bacteria. IPTG is commonly used in cloning procedures that require induction of β-galactosidase and is most often used with X-Gal or Bluo-Gal for blue/white colony screening or Magenta-Gal for red/white colony screening of bacterial colonies. IPTG is also used in the induction of recombinant proteins. In those systems, a protein of interest is encoded downstream of the IPTG inducible promoter. In the presence of IPTG, the protein of interest is induced in the cell culture. The culture can then be lysed and the protein expressed and purified through a number of methods, including His Tag or GST purification systems. This is a synthetic product and is free from BSE/TSE. Dioxane free, molecular biology grade.